E8 Storage is a pioneer in shared accelerated storage for data-intensive, high-performance applications that drive business revenue. E8 Storage's affordable, reliable and scalable solution is ideally suited for the most demanding low-latency workloads, including AI, genomics, real-time analytics, financial and trading applications, and large-scale file systems. Driven by the company's patented architecture, E8 Storage's high-performance shared NVMe storage solution delivers 10 times the performance at half the cost of existing storage products. With E8 Storage, enterprise data centers can enjoy unprecedented storage performance density and scale, delivering NVMe performance without compromising on reliability and availability. IBM Spectrum Scale helps solve the challenge of explosive growth of unstructured data against a flat IT budget. Spectrum Scale provides unified file and object software-defined storage for high performance, large scale workloads on-premises or in the cloud. Spectrum Scale includes the protocols, services and performance required by many industries, Technical Computing, Big Data, HDFS and business critical content repositories. IBM Spectrum Scale provides world-class storage management with extreme scalability, flash accelerated performance, and automatic policy-based storage tiering from flash through disk to tape, reducing storage costs up to 90% while improving security and management efficiency in cloud, big data & analytics environments. 1 Client Nodes Spectrum Scale File System 5.0.1.1 The Spectrum Scale File System is a distributed file system that runs on all client nodes to form a cluster. The cluster allows for the creation and management of single namespace file systems. 5 Storage Appliance Operating System RHEL 7.4 The operating system on the storage appliance was 64-bit Red Hat Enterprise Linux version 7.4.
numaMemoryInterleave yes Enables memory interleaving on NUMA based systems. verbsRdmaSend yes Enables the use of Ethernet RDMA for most Spectrum Scale daemon-to-daemon communication. verbsPorts mlx5_1/1/1 Ethernet device names and port numbers. The Spectrum Scale configuration parameter was set using the mmchconfig command on one of the nodes in the cluster. The verbs settings in the table above allow for efficient use of the RoCE infrastructure. The settings determine when data are transferred over IP and when they are transferred using the verbs protocol. maxStatCache 0 Specifies the number of inodes to keep in the stat cache. workerThreads 256 Controls the maximum number of concurrent file operations at any one instant, as well as the degree of concurrency for flushing dirty data and metadata in the background and for prefetching data and metadata. maxMBpS 16k Specifies an estimate of how many megabytes of data can be transferred per second into or out of a single node. pagepool 6g Specifies the size of the cache on each node. maxFilesToCache 10m Specifies the number of inodes to cache for recently used files that have been closed. ignorePrefetchLUNCount yes Specifies that only maxMBpS and not the number of LUNs should be used to dynamically allocate prefetch threads. prefetchAggressiveness 1 Defines how aggressively to prefetch data. 1 means prefetch on 2nd access if sequential. prefetchPct 5 Specifies what percent of the pagepool (cache) can be used for prefetching. syncInterval 30 Specifies the interval (in seconds) in which data that has not been explicitly committed by the client is synced systemwide. maxActiveIallocSegs 8 Determines how many inode allocation segments a client is allowed to select in parallel. openFileTimeout 86400 Determines the max amount of seconds inode information is allowed to stay in cache after the last file open. The configuration parameters for the Spectrum Scale file system were set using the mmchconfig command on one of the nodes in the cluster. The nodes used mostly default tuning parameters. A discussion of Spectrum Scale tuning can be found in the official documentation for the mmchconfig command and on the IBM developerWorks wiki at https://www.ibm.com/developerworks/community/wikis/home?lang=en#!/wiki/fa32927c-e904-49cc-a4cc-870bcc8e307c/page/Tuning%20Parameters (for additional information on tuning parameters see http://files.gpfsug.org/presentations/2014/UG10_GPFS_Performance_Session_v10.pdf). The E8 Storage controller used default parameters for all volumes. A single Spectrum Scale file system was created with a 1 MiB block size for data and metadata, and 4 KiB inode size. The 14TB file system has 1 mixed data and metadata volume (aka pool). Each client node mounted the file system. The nodes each had an ext4 file system that hosted the operating system. The E8 Storage appliance has 24 750GB Intel Optane drives configured as a 22+2 RAID group for data protection, with a 16+2 stripe size. The mixed data / metadata volume was provisioned from this single RAID group, with the volume spanning all drives in the RAID group. All client nodes had shared read / write access to the single volume. The cluster used a single-tier architecture. The Spectrum Scale client nodes performed both file and block level operations. Each node had access to shared volumes, so any file operation on a node was translated to a block operation and serviced on the same node. 1 1 GbE admin network 32 Each Spectrum Scale node and E8 Storage controller connects to a 1 GbE administration network with MTU=1500. The 1GbE network was used for administrative purposes and for Spectrum Scale inter-node communication. 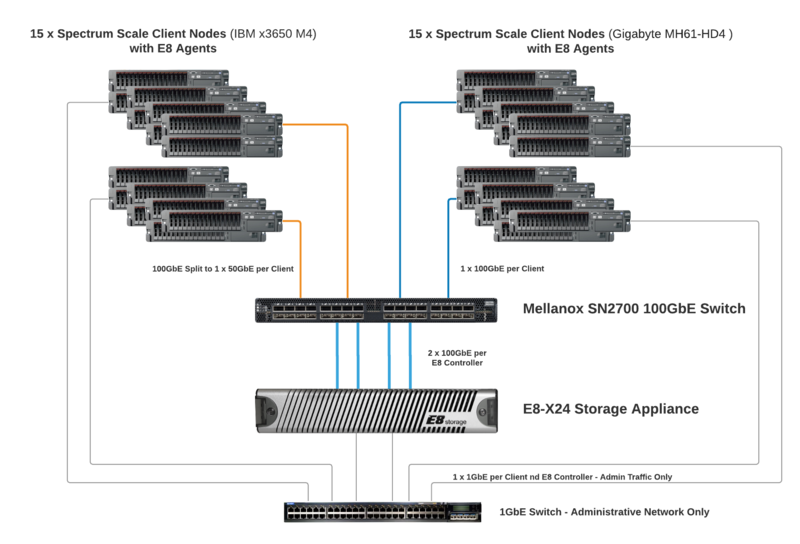 All benchmark traffic flowed through the Mellanox SN2700 100Gb Ethernet switch. 15 client nodes had a single active 50Gb Ethernet port which was connected to the switch with a split cable (2 50GbE clients per 100GbE switch port), with the remaining 15 clients direct connect at 100Gb Ethernet to the switch. 2 Juniper EX4200 Series 8PoE 1Gb Ethernet 48 32 Administrative network only. The default configuration was used on the switch. In the client nodes, Spectrum Scale reserves a portion of the physical memory (per the pagepool setting above) for file data and metadata caching. Some additional memory is dynamically allocated for buffers used for node to node communication and up to 10 million inode stat informations per node. In the E8 Storage controller, a portion of the physical memory is reserved for block write data and system metadata caching. The E8 Storage controller uses a portion of internal memory to temporarily cache write data (as well as store modified data) before being written to the SSDs. Writes are acknowledged as successful once they are stored in the controller write cache, and a redundant copy is kept by the E8 Agent on the host. In the event of a controller failure, the hosts will replay the write cache for the surviving controller. In the event of a power failure, each controller has backup battery power which is combined with power-fail protection on the SSDs to ensure data is committed to SSDs prior to shutdown. The solution under test was a Spectrum Scale cluster optimized for small file, metadata intensive environments. The Spectrum Scale nodes were also the load generators for the benchmark. 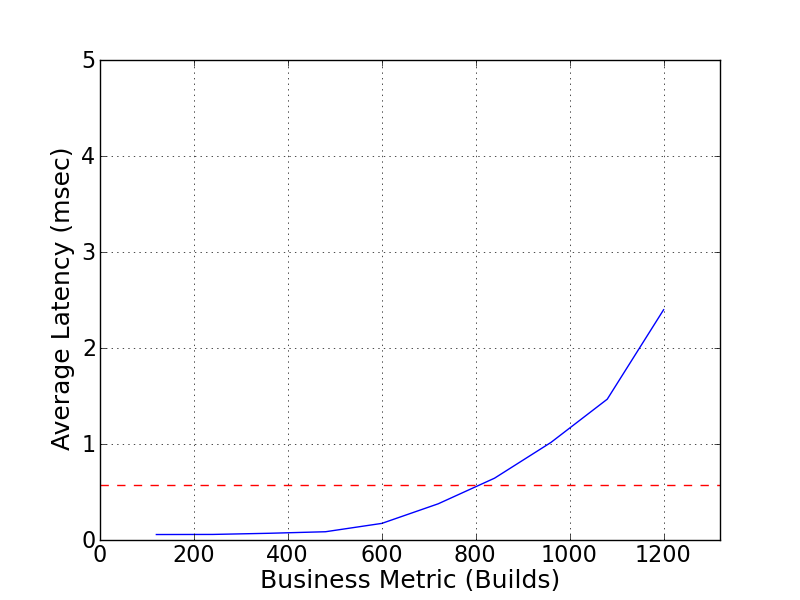 The benchmark was executed from one of the nodes. The 30 Spectrum Scale nodes were the load generators for the benchmark. Each load generator had access to the single namespace Spectrum Scale file system. The benchmark accessed a single mount point on each load generator. In turn each of mount points corresponded to a single shared base directory in the file system. The nodes process the file operations, and the data requests to and from the backend storage were serviced locally on each node by the E8 Client Agent. IBM and IBM Spectrum Scale are trademarks of International Business Machines Corp., registered in many jurisdictions worldwide. Intel and Xeon are trademarks of the Intel Corporation in the U.S. and/or other countries. Mellanox is a registered trademark of Mellanox Ltd.